Grant Fuhr played in 1018 games in NHL career. Add all the junior, All Star and international games, and it must be pretty hard to choose a top ten most memorable games from such a storied career. But that is what Grant Fuhr has done in his new autobiography, Grant Fuhr: The Story of a Hockey Legend . Not surprisingly his NHL debut, his 1-0 shutout win in Game 1 of the 1984 Stanley Cup final en route to Oilers first Stanley Cup victory top the list. So is the dramatic 1987 Canada Cup. The book is written with Bruce Dowbiggin. It is a typical jock-autobiography, with Dowbiggin turning hours of interviews into a retelling Fuhr's career. But I really enjoyed how they allowed Fuhr's unedited comments to jump in regularly, adding a lot value to the text. For all his accomplishments, Fuhr had some blemishes in his career, namely his suspension from the sport due to cocaine use. Dowbiggin pursues it and Fuhr is very open about it, wanting readers to realize everyone mistakes, but you can overcome these shortcomings. Fuhr, who also had to deal with racial issues, says he is completely comfortable with his past and with who he is now. It is a good message from one of hockey's good guys - a message maybe all young hockey stars should read. 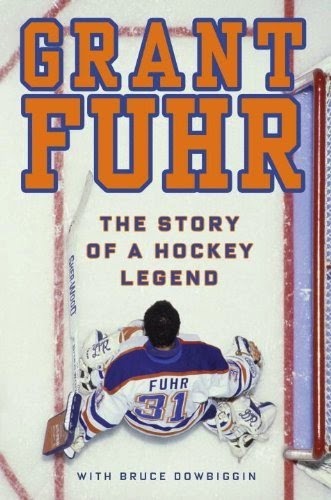 From The Publisher: GRANT FUHR was the Hall of Fame goaltender for the Edmonton Oilers, and the first black superstar in the National Hockey League. He is now a role model and fundraiser for charity, inspiring young goalies around the world. Fuhr plays golf at the professional level on the pro Stars Tour, starring with ex-professional athletes who benefit charities by their activities.